In this painting, Alfred Jacob Miller captures democracy in action. Although best known for images of the American West, including paintings of Native American culture and life on the frontier, Miller actually spent most of his career in his native Baltimore. This lively painting represents the small-town voting experience in Catonsville, Maryland, about five miles west of Baltimore. It is one of a small number of surviving, local, genre scenes—depictions of everyday life—by the artist. 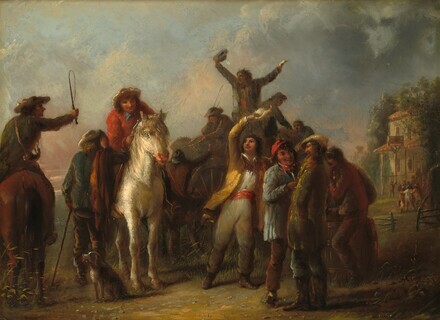 The painting is not dated, but scholars believe it to be the same Election Scene painting that Miller exhibited at the Pennsylvania Academy of Fine Arts in May 1861. It can therefore be understood as an image of the 1860 race in which Abraham Lincoln was elected president. Miller showcases discussion and debate among people from a cross section of classes and ethnicities; the animated hand gestures of the figures direct the viewer's gaze to the polling station on the right. The artist's composition featuring such active civic participation reinforces the ideals of an election day. Additionally, the inclusion of a small group of African American spectators standing outside the polling station provides a subtle reference to the issues at stake in this election. Sold 1869 to Columbus Miller. Charles Bowden. Henry Bowden. (Hirschl and Adler, New York); purchased by Lansdell K. Christie for the Corcoran Gallery of Art, Washington; acquired 2014 by the National Gallery of Art. Thirty-eighth Annual Exhibition of the Pennsylvania Academy of the Fine Arts, Philadelphia, 1861, no. 537, as An Election Scene. The Paintings of Alfred Jacob Miller: Artist of Baltimore and the West, Peale Museum, Philadelphia, 1950, no. 7. American Painters of the South, Corcoran Gallery of Art, Washington, 1960, no. 114, repro. Progress of an American Collection, Corcoran Gallery of Art, Washington, 1963, unpublished checklist. Corcoran [The American Genius]. Corcoran Gallery of Art, Washington, 1976, unnumbered catalogue. Of Time and Place: American Figurative Art from the Corcoran Gallery, Corcoran Gallery of Art, Washington; Cincinnati Art Museum; San Diego Museum of Art; University of Kentucky Art Museum, Lexington; Hunter Museum of Art, Chattanooga; Philbrook Art Center, Tulsa; Portland Art Museum, Oregon; Des Moines Art Center; Museum of Fine Arts, St. Petersburg, FL, 1981-1983, no.8, repro. 350 Years of Art & Architecture in Maryland, Art Gallery and the Gallery of the School of Architecture, University of Maryland, College Park, 1984, no. 28. Torchlights to Television, Maryland Historical Society, Baltimore, 1987, no catalogue. Figuratively Speaking: The Human Form in American Art, 1770-1950, Corcoran Gallery of Art, Washington, 2004-2005, unpublished checklist. Encouraging American Genius: Master Paintings from the Corcoran Gallery of Art, Corcoran Gallery of Art, Washington; Museum of Fine Arts, Houston; Parrish Art Museum, Southampton; Mint Museum of Art, Charlotte; John and Mable Ringling Museum of Art, Sarasota, 2005-2007, checklist no. 31. The American Evolution: A History through Art, Corcoran Gallery of Art, Washington, 2008, unpublished checklist. American Journeys: Visions of Place, Corcoran Gallery of Art, Washington, 21 September 2013-28 September 2014, unpublished checklist. Strong, Lisa. "Alfred Jacob Miller, Election Scene, Catonsville, Baltimore County." In Corcoran Gallery of Art: American Paintings to 1945. Edited by Sarah Cash. Washington, 2011: 118, 124-125, 265, repro.